Please note that dlr LexIcon will be closed from Friday 19 to Monday 22 April inclusive for the Easter bank holiday weekend. The exhibition opened to the public on 14 April. This exhibition features work from twelve Irish established and emerging craftspeople. It is specially selected by a group of Dún Laoghaire-Rathdown based Men’s Shed members in collaboration with curator Orlaith Ross. More details. Emerging Artist Grants support individual emerging artists from Dún Laoghaire-Rathdown to develop and further their practice through the creation of new work at this vital stage in their career development. Successful recipients will receive an award of €2,000 for the development and creation of new work. More information can be found here. The closing date for the submission of online applications is April 18th 2019. 'Access All Areas' is an award that is designed to respond to the need for better access to cultural activities at local level for people with disabilities.Loaded Dice Theatre Company are the recipients of the award. Loaded Dice is a theatre company comprised of adults with intellectual disabilities. They'll present 'Do We Not Laugh? ', a comedy based on the devised work of the company's actors all of whom have an intellectual disability, in the Studio dlr LexIcon at 11am on Friday 11 May - free admission, email to reserve tickets. 'All Aboard Again' is an artist residency focusing on young people with intellectual disabilities based at the Grainstore, dlr's Youth Arts Facility. We are delighted to announce that the recipient is All in Arts, led by musician, Jonathan Reynolds, who has led participatory music and art projects for 20 years with a focus on work with people with intellectual disabilities. Every Friday from 11am-1pm, suitable for adults. Join our Open Studio, it doesn’t matter if you are new to this sort of thing or a practicing artist, come along. Artist Emma Finucane will be on hand to help as little or as much as you’d like, materials and space are free. 22 people maximum. No booking required, just drop in. If you would like to receive updates on the Adult Open Art Studio (i.e if we need to cancel at short notice) you can subscribe by clicking here. You can now listen to recordings from our popular Artists in Conversation series by clicking here. CoisCéim BROADREACH coming soon to Ballyogan! CoisCéim BROADREACH are coming soon to Ballyogan as part of the EXIT 15 Programme. 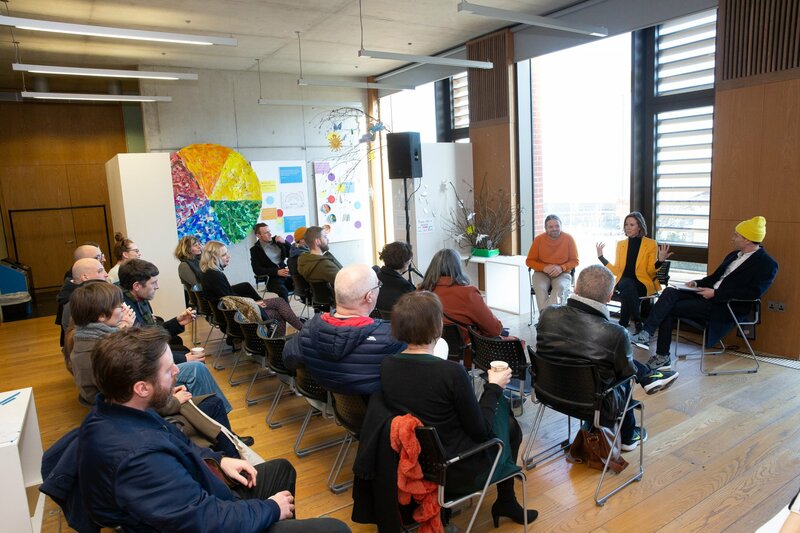 Following an open competition they have been selected to lead the next phase of EXIT 15, the partnership arts programme between Dún Laoghaire-Rathdown County Council and Voluntary Arts Ireland that has been connecting with local people in the Ballyogan area since 2016. Led by Philippa Donnellan, over the next 8 months BROADREACH will be looking for interested local people to develop a bold, imaginative project that involves dance, fun and imagination! More information will be announced soon so keep an eye out. On the second Tuesday and Saturday of the month join our Open Art Studio for kids of all ages. If your child likes to paint, make, draw, fold or sculpt then this is not to be missed. Artists will be on hand to help as little or as much as you would like. Materials and space are free. No booking required just drop in.